The easy visa situation in Cambodia makes moving to this country so appealing. Cambodia is on of the esiest countries in the world to emigrate to. It exists different types of visa and they are different way to get one. This visa is the best for everyone who know they will be staying 30 days or less. You can get it bevor you move to cambodia "in advance" or "on arrival". The visa on advance is more expencive than the visa on arrival. At the moment i don't know the price, because they changed some weeks ago. The visa on arrival is available to travelers (not for every country) for a cost of $30. After 30 days you can renew the touristic visa for a repayable $45 fee. After this process and if you like to stay longer, You have to leave Cambodia and come back to obtain a new visa. If you planning on staying in Cambodia you should take an ordinary visa. 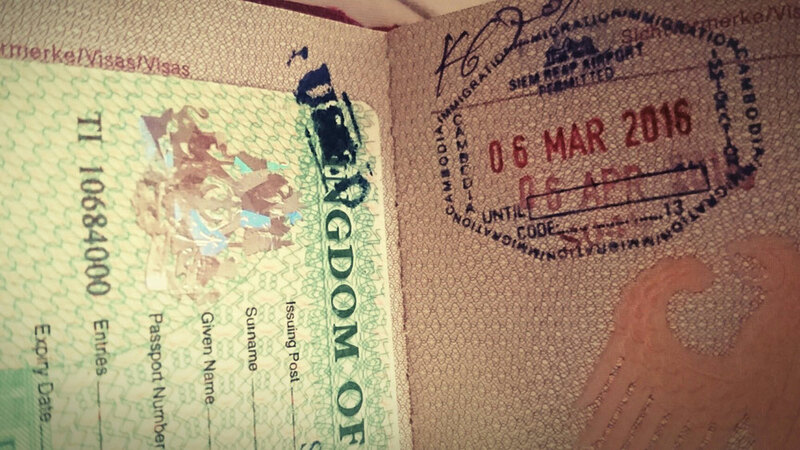 For everyone who plan to stay in Cambodia for an unknown time is this visa the best option to entern Cambodia. For the first visit you also get a 30 - days - visa like the tourist visa. But the difference bewegen these both is, that you can extend the ordinary visa indefinitely. After the first visit you extend this one from indside the country for 1,3,6 or 12 months. With the 1-3 months visa you have online a Single enrty. If you leave the country you have to get a new one. With the 6 - 12 months visa you can leave and return however you prefer. If you like to work in Cambodia you also need a Cambodian work permit. - A passwort which is valide for more than 6 months. You can get a visa on arrival St the internationalen airport in Phnom Penh and Siem Reap. When You arrive there are some printed forms to fill in for the visa and there are plates which show you the ways. You just need the passphotos and the 30 Dollars. Everything goes very fast anyway you will see that you luggage are taking some extra rounds. It's not to compare with the arrival by bus. You can also get a visa on arrival At a land border crossing. The visa at a land border crossing is not recommended. You're getting generally a Lot of hassel and you need much time and more money as you would pay on arrival by airplane. If you decide anyway to get the visa on this was, take online 30 dollar with you because they try to charge you always extra money. But you have also the possibiliy to get a visa an advance before you're crossing the border by bus. Than You have to pay a little bit more for the visa as by arrival by airplane, bit it's better than to debate with the police at the border. Sometimes companies will not take you with them if you don't have a return ticket and you want to get a visa on arrival. You should Check this before. Of you are from Afghanistan, Algeria, Bangladesh, Iran, Iraq, Nigeria, Pakistan, Saudi Arabia, Sri Lanka, or Sudan or you just want to get a visa on advance you have to contact the closest Cambodian embassy in Your home country. If you are on traveling you have to contact the Cambodian embassy in the country you are staying before Cambodia. This visa is just available for people from countries who can get the visa on arrival. Not for these countries i listed before. It costs $7 extra than the visa on arrival and Since June 2015 they have additional an extra $3 processing fee. All together you have to pay $10 more than for the visa by arrival. It's easy but not recommended. It is possible to overstay Your visa in Cambodia, but of course you have to pay for it. It costs in the first 30days of overstaying $5 a day and After that 30days $6 per day. If you Plan to stay a few days more than Your official tourist visa it can be cheeper to ist this option. The payment for the overstaying is to pay at Immigrantion on Your way out of Cambodia.